Welcome to Trinity - a church placed at the heart of Stafford's town centre, between Sainsburys, Wilko and Stafford Market. You can't miss us! We place God at the centre of our lives and we serve Jesus in the world. We hope you will be blessed by your visit with us and enjoy the chance to come with us as we journey with God at the centre! 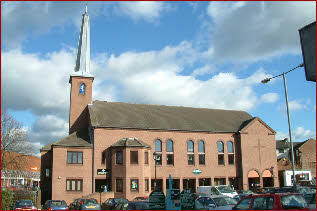 Trinity Church is a United Reformed and Methodist partnership in the heart of Stafford’s town centre. We extend a warm welcome to all who wish to join with us in our Christian witness. We try to reflect a modern approach in our life and worship while respecting the basic traditions of our partnership. We believe we have a mission to reach out to help all those, particularly in the town centre, who seek spiritual support, companionship, refreshment and care, whatever their background. Our morning Tea Room often provides the first point of contact and many regularly come in to enjoy the warmth of this fellowship. We are blessed in having a mixed aged congregation, with children enjoying their Junior Church or Sunday Club/Pilots activities following a short time within the main Sunday morning worship. Many groups meet regularly within our fellowship and include house groups, drama, rambling and singles. Scouting and Guiding groups also meet here beneath our ‘umbrella’ of care. Because of our location at the heart of the town, working in the community is our main way forward. We have links with Love Stafford, the local college and the Town Centre Partnership. Trinity is a busy place. Our aim is to provide a sense of daily living that emphasises the love of God as shown by Jesus Christ to all those who, like us, are in need of more out of life.